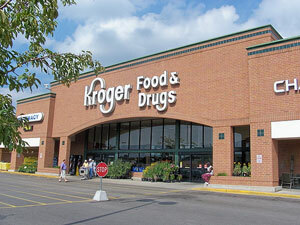 Kroger (NYSE:KR) is the nation’s largest supermarket chain, and has benefited from the consumer eating at home more often during the recession. Furthermore, store brand items have been selling better in the last few quarters because of the trade-down effect. However, Kroger reported a more difficult quarter than analysts had expected earning just $254 million or 39 cents per share, compared to $276 million and 42 cents per share last year. Wall Street was expecting earnings to grow to 44 cents per share, and clearly the disappointing quarter is hurting the stock, down nearly 8.5% in morning trading. Analysts were expecting sales to show a slight gain over last year, but instead they slipped about 2%. Perhaps this is attributable to more people eating out again as the economy has started to improve, but we think it is more likely that consumers are continuing the trade down trend towards discounters such as Walmart (NYSE:WMT) and Costco (NASDAQ:COST). Kroger has rejected offering quarterly guidance, but they have lowered their estimates for the full year. They now expect to earn between $1.90 and $2.00 per share, which falls below their previous guidance for $2.00 to $2.05. Management said that the worse than expected quarter reflected changing consumer behavior and other factors related to the economic environment. Furthermore, they said that they expect that these difficulties will effect the company for the rest of the year. One of those concerns would be the deflation on food prices hurting sales totals for Kroger. Previously, we had thought that Kroger’s strong store brands and cost conscious consumers would help out Kroger more than hurt it, but we are starting to wonder about that thesis now. Perhaps consumers are so cost conscious that they are willing to go the extra mile in order to achieve additional savings at the bigger discount retailers. Kroger stock has been range-bound between about $19.50 and $23 since last February, and after today’s weak results they are trading near the 52-week low. Although, today’s announcement is disappointing we think that this is a value opportunity for the defensive minded investors. Sales and earnings did disappoint, but the company is still fundamentally strong and selling at a substantial discount to the historical norms. For example, Kroger is trading well below its ten year price-to-cash earnings average range of 7.4x to 10.7. Likewise, price-to-sales is currently about .18x, but historically a range of .24x to .36x has been where the market values KR stock. We are not saying that the difficulties are behind Kroger, but rather that for a long term value investor it is Undervalued. The results from the last quarter are a concern, but if you believe that consumers have shifted priorities and are going to be less likely to spend where it is unnecessary then Kroger is a good bet. It is trading at a more attractive multiple than Walmart and half the multiple of Costco, even after considering Kroger’s more conservative full year earnings guidance. Today’s sell off may be a great opportunity to buy an industry leader cheaply, and we would not be surprised to see it selling near $30 in two years time.